Hi, my name is Chernobyl. I live in West Unity, NH and I am hoping someday for my forever home. I came from some breeders who were going to have my friends and I culled in just two more days. We were going to be eaten or killed for our beautiful fur, they said. It seemed like it was a normal thing for them to do this to us at the end of each year. We were over 6 months old now and who wants old show rabbits anyway? I didn’t really feel like we were old at though. It was early November and most of us were in a shed. We were bred to be show rabbits. Some of us were in cages outdoors and we were going to be the first to go since we didn’t make the best show bunnies. Thankfully, my foster parent took all 14 of us with the help of a rescue league in NH. A few of us had gotten sick and needed antibiotics. Fortunately, we all survived and some of us have been adopted to forever homes. I have had a wonderful life here so far. Last summer I got to go outdoors and play on the grass in a huge fenced in area with some of my friends. The sun felt so nice and it was wonderful to eat grass, clover, and dandelions. My foster Mom would keep us safe by sitting with us in the lawn chair. Sometimes the cats and dogs would be with us too. I even went on a 2-month vacation to another nice ladies house. My foster Mom would love to keep me, I’m sure, since she loves me so much but she has 15 of us still in her house and it is very hard for her to give us all enough attention. In the morning, I am starving so much – I need my pellets right away!!!! When my foster Mom comes in to feed us, I show her how hungry I am by stretching to the top of my cage and biting on the bars. I close my eyes as I chew on the bars and hold on to the top of the cage with my front paws. All I can think of is my pellets, carrots, and lettuce!!! I don’t know how this happens, but I usually fall backwards. That’s ok; I just get up and do it all over again. Lucky me, I always have hay in my cage but I never had it before I came to live here. My breeders told my foster Mom that hay isn’t good to give rabbits. DUH? What about my teeth? They need hay to grind them down!!! And although I do eat some hay, I prefer my pellets. I really like evening time after supper when I can run around a little outside of my cage. Wait! I think I hear something in the hall. Oh good, it’s time now! Here she comes. She opened my door and off I go. I’m running down the hall to try to get to the kitchen now. Look Out Cat! Woops! The cat jumped right over me. Oh, Oh! Here comes that controlling Sheltie Dog! Oh good, she just walked past me. Now I need to jump through this gate and get into the kitchen! Free at Last! Hmmm…. Something is blocking the door to the entryway. It wasn’t here before. Maybe I’ll walk over it. Oh Dear, it moved. Yikes, it’s another dog – a golden retriever mix! I guess it didn’t mind me trying to climb over it but I think I’ll stop while I’m ahead! I’ll just play in the kitchen for a while. I like when my foster Mom calls my name. I usually go looking for her right away. I even go back down the hall to my room and jump back into my cage for her. So my life is pretty good here for now but I would really love to get my forever home someday. Please say you will adopt me. I’ll be waiting for your call. The number is 781-431-1211! Special thanks to Janet, Berta’s previous fostermom in West Unity, NH, for her contribution to this blog! Hi, my name is Berta. My first foster Mom named me after a wonderful man named Albert who rescued me. Albert noticed me running around his yard in the summer along with my mate. We came across the street from the rich side of town. We kept getting bored in our cages so we liked to sneak out now and then. Our owners told Albert that they were tired of trying to catch us all the time and they just didn’t want us anymore. Now we were sad, scared, and on our own. We were just trying to have a little fun since no one ever bothered with us at our home anyway. One day my mate was run over by a car, and he just wouldn’t get up to play with me again. I soon knew I was pregnant too! In a few days my babies were born. I needed help, and I didn’t know how to take care of them. Someone caught one of my babies and I don’t remember what happened to the others. I was horrified now and all alone except for Albert. He watched me every day and put carrots and food outside for me. I would let him get close to me but not too close. It was nice of Albert to let me go in to his sheds all summer; he worried about me every day. Albert wondered where he could take me if he caught me. Now it was early November and started getting cold outside at night. Albert called his Humane Society in St Albans, VT to see if they could help me. They told Albert “No, we are not taking any animals because we are at war with City Hall! We are telling everyone to bring the animals to City Hall and open the door and let them loose!” Well Albert certainly wasn’t going to do that with me. So he called his vet and asked if she knew anyone who would want me. The vet gave Albert a nice lady’s phone number from Shelburne, VT. Then things happened fast! She emailed my first foster Mom and told her all about Albert and me. Then my first foster Mom emailed Suzanne at House Rabbit Network in Massachusetts and asked her if she would take me if Albert caught me! Yippee! Suzanne said yes, so my first foster Mom sent Albert a newsletter called Rabbit Tracks, which talked about ways that Albert could try to catch me. I didn’t realize Albert could be so sneaky. So sure enough, I hopped into a wire cage that had cornstalks all over it, and BANG! The doors slammed down and I was stuck in there with bananas! Next thing I know I am in Albert’s living room in his dog’s crate and he is on the phone telling someone he caught me! So then, I went on this long journey. A lady picked me up and brought me to her house. Then her sister took me all the way to West Lebanon, NH. Help! Why are we stopping in this Burger King parking lot in the dark? Am I doomed? Don’t they eat animals in there? Oh no, here comes another car and now I am going into this one. Oh good, we are leaving Burger King and heading to West Unity now! Well, here I am at my Foster Mom’s home. Look at all these animals in this house! I like my new cage and all my friends in this rabbit room! There are even rabbits in the living room. Oh the poor guinea pigs, they have to move into the bedroom now! They won’t be able to enjoy us all thumping and chewing on the cage bars at night. I like playing in the hall! My foster Dad even puts me on the bed to hop around! They are sooooo nice to give us so much of the house. I suppose they will have to be moving into that big old barn way out back soon where the coyotes hang around. After all, it looks like we are taking over the house. That is so nice of them! Just think that in a few months I will make it to Massachusetts to see Suzanne, and finally look for my forever home. Then I can send happy pictures of me to my first foster Mom and Dad in that old barn in West Unity, so they will see how happy I am now. I’ll also send pictures to Chernobyl, my rabbit friend, who is keeper of the house there now. He still lets my foster Mom and Dad come in from the barn to use the kitchen. He will do anything for them! Well, now I am living in the Boston area with my new foster parents. They are really nice! They keep telling me how cute I am and that I will be sure to get my own forever loving home real soon. Sounds like a plan to me! Dahlia – Can Love Blossom for Her “friend”? Comments Off on Dahlia – Can Love Blossom for Her “friend”? Hi, my name is Dahlia. If you have a minute, I’d like to tell you about a warm, loving bunny friend of mine. She is a handsome girl that was struggling to survive with lots of other buns in a neighborhood in Plymouth. Well the nice people at House Rabbit Network came, scooped them all up, and placed them in comfortable, safe foster homes. Since my good friend needs extra room to sprawl out, (you know, as you lie on your tummy with your front and back legs stretched out, kinda like a Superman pose but we call it the “suuuper bunneee”) she’s fortunate to reside in an exercise pen in her foster home! And she’s fastidious with her housekeeping, very organized and tidy, and is proud that she has refined her litter habits to perfection; living free-range would suit my friend. She is grateful that she consistently is served delicious meals, regularly enjoys pedicures, and is appreciative of her playtime. Now, here is a girl who likes to have fun and needs lots of space where she can play fetch! Yup, it’s hilarious to see her toss her toys and play rabbit fetch :) Having an inquisitive friendly nature, she loves to explore and interact with the family as well! And even though playing is right up there with her favorite things to do, finding a patch of sunshine, sprawling out for a nap, and listening to the TV in the background is pretty close behind for this calm, laidback bunny. This life seems to suit her well, but she knows something is missing. She often hears the HRN volunteers talking about “forever loving homes”; she has seen some bunnies at her foster home leave with their own families. Doing the independent, single thing seems to have worked well up until now; however, maybe she just needs to meet that special “somebun” to change her mind, to snuggle up with at night….. Lately, my dear friend is feeling a bit lonely, as she waits patiently for a family to share their love and home with her. Well, I have to confess, there really is no “friend” is this story. It is about me and my yearning to find someone to love me. I don’t want to spend another Valentine’s Day flying solo…..I want a family to cherish me! Betty & Bert – The Hoppy Couple! If House Rabbit Network was looking to start a “Bunny Olympics” gymnastics team, we think that Bert and Betty would be their respective team captains…. These two just LOVE their playtime. Once comfortable with their surroundings, all you need to do is stand back and watch. There goes Bert with an amazing bounce over a foot straight up in the air. Not to be outdone, Betty throws in one of her amazing 360 degree spins and then dashes off with a kick. These bunnies delight in binkying every which way. One is popping up while the other is gliding through the air; honestly, it’s a wonder they don’t have a mid-air collision. To watch them play so joyfully just plain makes you laugh out loud! When Betty and Bert slow down a bit for a break, you can see they are very devoted to one another. It is so sweet how they groom and snuggle close to one another. Their litter box habits are excellent, as well! This adorable pair can be a bit shy but the good news is that their foster mom, Suzanne, has been working patiently with them, and they are now beginning to enjoy some pets. With some patience and lots of love, the right person or family will easily be able to make these bunnies feel safe and comfortable in their forever home. Give the HRN hotline a call at 781-431-1211 today to set up a time to visit with Betty and Bert. They might just steal your heart! Brownie & Isabel Groove To The Music! Brownie and Isabel are a friendly, sweet pair of bunnies that love to snuggle all the time. Even though they look nothing alike, they are mother and daughter. We rescued Isabel from a law enforcement case and she quickly had a litter of babies. Brownie has always been attached to her mother. Being a young bun, she is very athletic and loves to dance, bounce, jump, twirl, and dash around! She comes right to the edge of the cage to check out everything that is going on! Isabel, on the other hand, is a gentle, graceful, calm bunny that appears to glide along as she moves. She enjoys being petted, in fact, she’ll smoosch right down for LOTS of pets :) Isabel is a beautiful girl with long, soft, fluffy fur that needs to be brushed on a regular basis. Both have excellent litter box habits. Update 4/5/09: Pipkin is now binkying with her ADOPTIVE family – congrats! Update 1/18/09: Pipkin is the cutest little munchkin :) She is so much more comfortable with people! Once she’s up and snuggled into your arms, she’s content to enjoy your pets. She’s also REALLY happy to be down exploring and doing lots of vertical binkies!! for sharing some of her experiences with her new little girl with all of us! Update 9/21/2008: I have had Pippy for almost a week now and she is getting cuter and more comfortable every day. Right now, she is cuddling on the couch in a fort of throw pillows that I set up. definitely thinks that she is a little queen. she does wiggle a lot and try to escape when u pick her up. When she gets really comfortable, she will come right up to my hand to be pet forever. Well that is the update for now! interesting. She is not high maintenance at all. interested in is my computer. She likes the caps lock button. Call our hotline number, 781-431-1211, and arrange your visit with Pipkin today! What’s wrong with you. I am still here looking for a home. 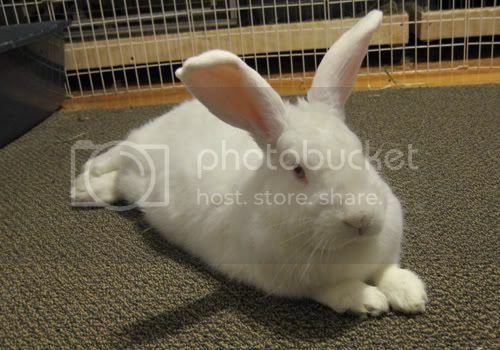 I am a very handsome and playful young bunny boy who would make a great addition to your family. Really?! I am awesome. You just have to love me. Here you see me with Peter Rabbit. My only friends in foster care. Besides my foster mom. But she also has to take care of her own bunnies Marlo and Oliver. Marlo is very sick and takes lots of attention. Oliver doesn’t like me. He is jealous. And look, I am taller than Peter. I am only 9 months, but a big boy already. But Peter does not groom me. I have to do that myself. My foster mom also brushes my pretty long fur every day. I am a fuzzy boy. Hey, here is a video of me and Peter. We get along quite well. Please call if you’d like to meet me. You will not be disappointed.